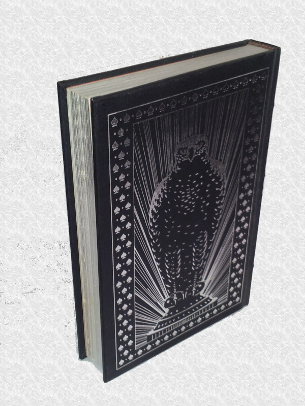 100s of Easton Press and Franklin Library Books for Sale !! The Franklin Library, a division of The Franklin Mint, was a publisher of fine collector edition books from the early 1970s until 2000. 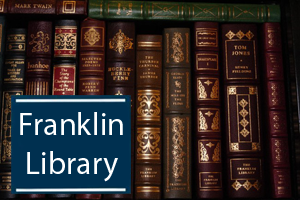 Known for beautiful leather bindings, Franklin Library books were published in three styles: full leather, leather-like cloth (leatherette), and quarter-bound leather. The Imitation Leather editions or Leatherette or Cloth Material - just a cheaper version of the full leather editions. These books are bound in Imitation Leather - Leatherete (Cloth Material) looks similar to a leather. Leatehrette books do not have the silk page marker or silk moire endpaper. Some of the books have silver decorations on the spine and covers as well as endpapers edges. The Quarter-Bound Leather meaning that the spines were covered in Leather (for an identical shelf presentation look to the more expensive full leather bindings) and the covers (boards) were Cloth covered - Leatherette. 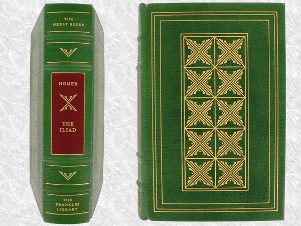 These books also have a silk page marker, however all have decorative paper endpapers and not silk moiré.